Our drawings, boards and project binder have all been turned in. We have presented to our class, professor and two design professionals. Our grades have been posted. And we rocked this project. Our group, consisting of Mandy, Lauren, Jess and myself managed to stay close friends and fully design and create an entire 10,000 sq. ft. space in three months. In this time period, we have learned quite a bit about the design industry, but also about ourselves. What we learned about ourselves: We really learned what kind of designers we are. Some of us are more laid back about design and pulled ideas out of thin air. Some of us are better at understanding technical aspects, and organizing the group as a whole. We also learned that the four of us work really well together and complement each other’s skills. This project was very challenging. To be focused on one project for that long of a time period was daunting, but it also allowed us to really develop our space. 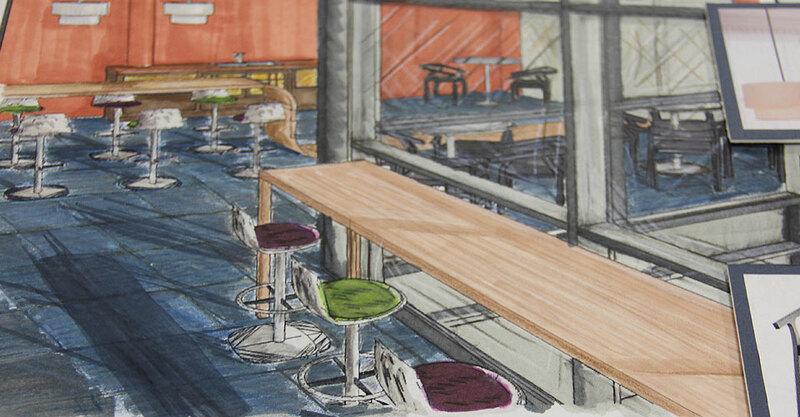 The easiest part of our project I would say was the concept and really envisioning our space. Three of us have been abroad and the other wants to travel, so we knew that the travel agency would be great for us. We also really enjoyed looking up destinations for inspiration and recalling our own experiences. This allowed us to translate what we felt about travel and planning into what the clients of Great Escapes would ultimately feel. The hardest part of this project were the technical drawings. We knew what the complete project would look like, so in our minds we had to take it from a 3D idea to a flat black and white line drawing. These drawings had to be precise. We had to make sure that every piece was annotated, drawn correctly, and met all codes and standards. We love each space within the office of Great Escapes, but I think our favorite space would be our break room inspired by Asia. The fun colors, the unique design and the ample natural light make this space so inviting. We couldn’t be more proud of what we have learned and accomplished this semester. There were many late nights, reprints, control zs, frustration and anger; but also laughter, excitement and relief. Thanks for following our project! We hope we have entertained some, educated some and inspired some about the world of interior design. I have included a link to a video of our presentation and well as to our digital presentation (Prezi) so you can really see our design. Don’t click too fast you may get sick. After designing a corporate travel agency, we all deserve a vacation. Happy holidays from the designers of Great Escapes!